The final table is set in the 2013 PokerStars Caribbean Adventure main event. A total of 987 players turned out for the 10th-anniversary running of this massive event at the Atlantis Resort and Casino in The Bahamas, building a prize pool of $9,573,900. Now only eight remain to battle for the title and the first-place prize of $1,859,000. 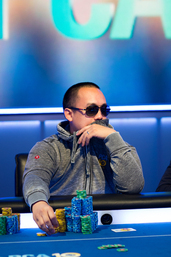 The chip leader heading into the final table is Jerry Wong with 7.4 million, or roughly 25 percent of the chips in play. Wong is a 30-year-old professional poker player from Brooklyn, New York. Second in chips with 6,475,000 is Joel “JMPRODIGY” Micka, a 24-year-old player originally from Everett, Washington. Micka has a number of sizable tournament scores, including a runner-up finish in the 2008 Latin American Poker Tour San Jose main event in Costa Rica. Other notables at the final table include World Poker Tour Montreal main event champion Jonathan Roy, longtime tournament professional Owen “ocrowe” Crowe and online tournament pro Yann ‘yadio1111’ Dion. 2010 Spring Championship of Online Poker Champion main event winner Ryan Fair was eliminated on the final table bubble after entering the final nine as the chip leader, ensuring that the remaining eight players are now guaranteed a payday of at least $165,900.